There are 26 Assisted Living Facilities in the Sparks area, with 9 in Sparks and 17 nearby. The average cost of assisted living in Sparks is $3,397 per month. This is higher than the national median of $3,346. Cheaper nearby regions include Carson City with an average starting cost of $2,995. To help you with your search, browse the 139 reviews below for assisted living facilities in Sparks. On average, consumers rate assisted living in Sparks 4.3 out of 5 stars. Better rated regions include Reno with an average rating of 4.4 out of 5 stars. Caring.com has helped thousands of families find high-quality senior care. To speak with one of our Family Advisors about assisted living options and costs in Sparks, call (855) 863-8283. Located just east of the city of Reno, Sparks, Nevada is the fifth most-populated city in the state, and it has one of the fastest-growing aging senior communities in the United States. It is located a short drive from the Lake Tahoe area, giving locals a great place to visit when they want to get out of town. There are 27 assisted living facilities in the Sparks area for seniors to choose from, all of which are certified and regulated by the Nevada Division of Public and Behavioral Health. Sparks, Nevada, weather ranges from high desert heat in the summer with temperatures into the 90s, to winter lows that are below freezing from November through March. It also has an average of 6 inches of snowfall each year, as it is a short drive from the mountains around Lake Tahoe. There is moderate air quality in the Sparks area, due to pollution from the surrounding city that hangs against the nearby mountains to the West. Pollen levels can also affect the air quality in Sparks on a seasonal basis. Sparks is just slightly above the national average for cost of living, with housing being the most costly aspect. Grocery, health care and utility costs, however, are even with or below the national average. The crime rate in Sparks is surprisingly high for a city of its size. It's above the national average but below the Nevada state average. Sparks is only 19 percent safer than most other American cities. The city of Sparks Regional Transportation Commission, or RTC, offers seniors something called the Washoe Senior Ride, which is open to any senior resident 60 years or older who lives in the county. They must apply in person and are given taxi bucks, which can help pay fares or tip drivers. Sparks has several world-class medical facilities, including Tahoe Pacific Hospital, in the event of medical emergencies or illnesses. Assisted Living costs in Sparks start around $3,397 per month on average, while the nationwide average cost of assisted living is $4,000 per month, according to the latest figures from Genworth’s Cost of Care Survey. It’s important to note that assisted living rates in Sparks and the surrounding suburbs can vary widely based on factors such as location, the level of care needed, apartment size and the types of amenities offered at each community. 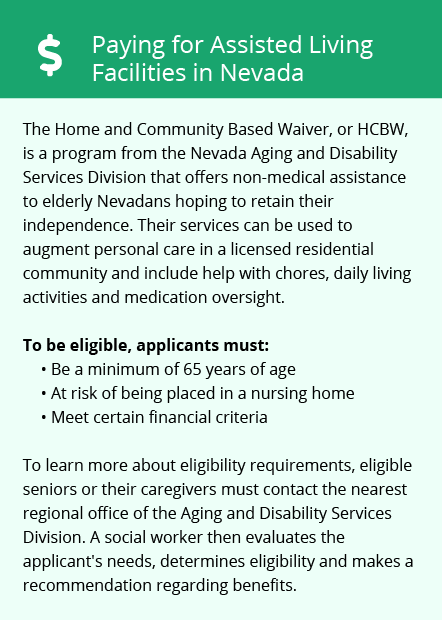 For those who need financial assistance for assisted living care in Sparks, an assisted living waiver can be obtained from the state of Nevada's Medicaid program where certain care is provided to senior residents in assisted living facilities in order to delaying or prevent the need for nursing home care. Learn more about these programs, plus who’s eligible, on our Assisted Living in Nevada page. For more information about different ways to finance assisted living, visit our Assisted Living in Nevada page. Sparks and the surrounding area are home to numerous government agencies and non-profit organizations offering help for seniors searching for or currently residing in an assisted living community. These organizations can also provide assistance in a number of other eldercare services such as geriatric care management, elder law advice, estate planning, finding home care and health and wellness programs. To see a list of free assisted living resources in Sparks, please visit our Assisted Living in Nevada page. 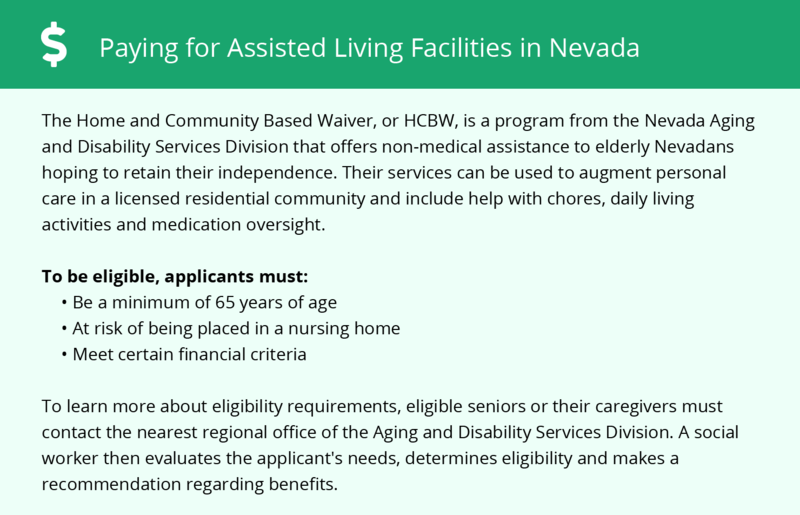 Sparks-area assisted living communities must adhere to the comprehensive set of state laws and regulations that all assisted living communities in Nevada are required to follow. Visit our Assisted Living in Nevada page for more information about these laws.